I was asked if I'd like to teach French to the Year 2s on a voluntary basis for the last term. I have now finished the 12 week stint and phew, was it challenging! 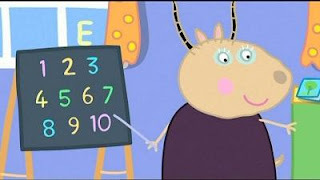 Madame Gazelle's picture (she's the teacher from Peppa Pig but most of you will know that) is here because from Week 1, I got the children to answer my Bonjour la classe with Bonjour Madameoiselle Stacey. I heard one girl say Bonjour Madame Gazelle Stacey! It was difficult not to laugh, but it kept my friends amused and I became known to everyone outside the school as Madame Gazelle! The teaching of the French wasn't actually the challenge. I had half the class (12) for half an hour each. I spent approximately 2 hours preparing for that half an hour lesson. Admittedly I wasn't using the curriculum, I just found materials and ideas on the internet. I'd print out flash cards and play fruit salad, or wait til we'd covered two topics, then create a bingo game on that card. God were they competitive? Which brings me to this - it was not the language that was hard to teach, it was the children. Again with no training, I had a teaching assistant with me. I think I was being too nice to them, so they took advantage. One day I was feeling under the weather, and told them I hadn't got much patience. That day they toed the line! I learned not to spend too much time answering individual questions, because you lose the rest of the group. I learned not to do boys -v- girls games, as they were too competitive. Some cried when they didn't win. I learned to go from one activity straight into another. Less time in between tasks meant more concentration. I would come home shattered - an hour's teaching French was tougher than a week at work. But of course it had its rewards. I never gave up, I kept trying - trying different tactics, different materials, different ways of making things interesting. On Week 9, I finally got one girl's attention. She'd hated doing the class before this, and would look like she was about to cry. When learning the weather (Il fait beau -v- il fait mauvais), she suddenly became very keen. She knew all the answers. When I said she'd done very well with the questions, she ran to the teaching assistant "She said I'd done really well". I felt I'd made a breakthrough. On the last lesson, she kept telling me she could count from 21 to 30. To be honest, I didn't believe her. She would start, then say "I can't remember". Right at the last minute, she said "I can do it." We were all dumbfounded when she counted almost totally accurately from 21 to 30! Her mum had taught her, she'd said. Although it sounds corny, I really felt that my hard work had been worth it. There were some excellent students in that class, with a good accent and a good memory for vocab. Then there was this girl. If a few of them went on to study French later in life, then my work would be done. At the end of term, I received a little bouquet of flowers saying "Thanks for helping out in our class". I was so touched.